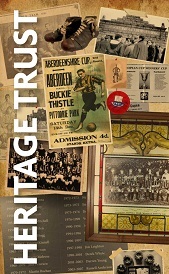 The Trust is an independent charitable organisation working closely with Aberdeen FC in order to care for, maintain, and expand upon the historical records and memorabilia of the Club, its supporters, and the community is serves. Since 2008 the Trust has been steadily gathering artefacts and pieces of historical data which will be preserved for future generations. In order to continue with this effort funding is essential. To this end we have arranged a fund raising evening to help us acquire further items such as programmes, player shirts, medals and other associated bits and pieces. In the longer term, as and when the Club relocates(!) we plan a museum and learning centre. We are therefore holding a quiz, with a heavy bias towards questions associated with Aberdeen FC, at Pittodrie, on Saturday 5 November 2016. The Quiz will be held in the Aberdeen Asset Management Suite in the RDS, Pittodrie with a 6:30 for 7.00 pm start. For parking access the Pittodrie Street car park from King Street to avoid traffic heading for the fireworks at the beach. Teams are of a maximum of 4, and cost is £80 per team. We are hoping to raise as much cash as we can for the Trust's coffers so hopefully a good lot of you will take a team!